I do try my hardest to watch at least a couple of film from all the most beloved, influential auteurs out there, but there's plenty I just have not had the time to get around to yet. Michelangelo Antonioni was, until a few hours ago, a director I had embarrassingly never made the effort to explore. Luckily, a BFI restoration of Red Desert currently playing here in Dublin has given me the opportunity to begin my exploration of the man's work. It's only a start - L'Avventura and Blowup are on my internal list of bucket - but I'm certainly curious to check out more based on the strengths of this one. The film opens with shots of a factory complex, and almost fifty years on they remain a stark, perceptive visualisation of rampant industrialisation. 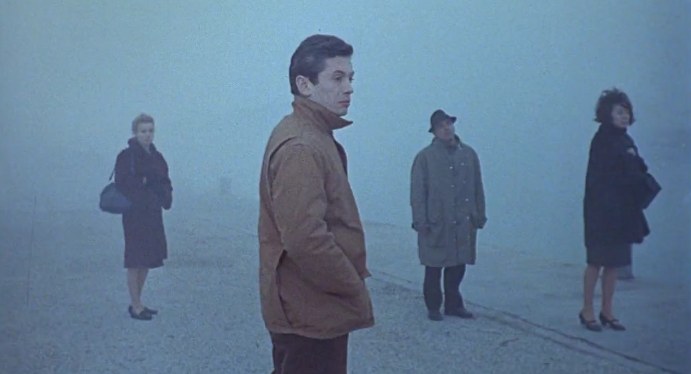 Antonioni is on record as claiming this isn't necessarily a bitter critique of impending environmental catastrophe, but rather an attempt to find beauty in the imagery and architecture of the modern world. It's hard through modern eyes not to view the damaged landscapes on display here as anything other than a harsh elegy for unspoiled nature: almost like Mon Oncle, this is seemingly a satire of industry run amuck. But there is a terrible albeit hypnotic beauty to be found in this film. The curving of pipes, a solitary flame emerging from a giant smokestack, a white cloud of smoke billowing out, the posionous yellow waste of the industrial process being released into the air - Antonioni and his crew conjure some stark, memorable images out of wholly unromantic settings. This is, indeed, a film in love with the possibilities afforded by colour cinematography (Antonioni's first work in Technicolour). The colours and camera movements are inspired - the stunning use of red particularly notable. The camera also flirts with focus throughout, creating a mise en scene that constantly challenges the viewer through complex, purposefully uncertain compositions. Editing furthers the film's technical mastery with sudden chronological shifts causing a powerful sense of unease. Whether it's a fog drenched harbour or a dank, polluted moor, this film is a sensory triumph. This is furthered by an early example of an unsettling, partially electronic music score from Giovanni Fusco and Vittorio Gelmetti. The visuals are of particular note, but the sound is consistently worthy of praise: creating a surreal & uneasy atmosphere that often makes this film resemble an existential horror film. Oh, we haven't got to the narrative! Our 'protagonist' is Giuliana, played by the elegant Monica Vitti. She's unable to adjust to the modern world, and uncertain of her role in it. She finds a potential soul mate in visiting businessman Corrado Zeller (Richard Harris), who has come to visit her husband in search of labour for a South American enterprise. Initially loosely plotted, the film ultimately settles on capturing Giulian'as mental breakdown. There are other themes presented - there's a few moments of socialist rumblings - but we're trusted to decipher them ourselves. I was reminded of Bergman's Through a Glass Darkly from time to time here: they both share a female protagonist in the midst of a confusing, debilitating depression, and both feel alienated from the modern world. To be honest, it's possibly the least convincing aspect of Red Desert, mainly because the film runs a little too long. While most of the film addresses its themes with subtlety and ambiguity, the last fifteen minutes or so lays on the breakdown stuff more bluntly, and it becomes somewhat exhausting. It's still impressive, and some of the final shots are haunting, but the film reaches its zenith during a dreamy, haunting beachside tangent that acts as a powerful contrast to the unsettling, uncomfortable tone of the rest of the film. There's certainly some fantastic sequences in there, alongside that particular coastal excursion. Another highlight comes at the midway point, with an extended party of sorts where a group of friends dismantle the walls of a cabin for firewood, followed by the eerie arrival of a (possibly disease riddled) ghostly ship. Even if Antonioni has a tendency to overdo his heroine's collapse, the film is mostly full of thematically ambiguous and visually arresting scenes that trust the viewer to make up their own minds. Plus, there's a really funny bit with a robot! Red Desert is a unique experience, and one whose aesthetic successes are best appreciated in a darkened theatre. It can be exhausting, but mostly its smart, provocative filmmaking. Like my first experiences with any number of great auteurs, it only took this one film to convince me that Antonioni is a director with a cinematic identity all of his own. I look forward to exploring his back catalogue and getting to grips with this fascinating stylist.